MSI has announced that it has updated its OC Genie firmware on its latest P55A mainboards to allow users to unlock the latest socket 1156 Intel Core processors. MSI is offering its 'Super Unlock' feature on its latest P55A series' BIOS, and believes that this offers major enhancement to overclocking performance. "To complement Intel's latest Core Processor (Socket 1156) which boasts the "Unlocked" overclocking function, MSI reveals its newest P55A Mainboard Series," states MSI's release. 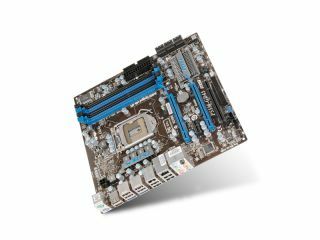 "This new mainboard series gives users improved overclocking performance with MSI's unique "Super Unlock" function enabling processors with a 3GHz default speed to boost the clock speed up to 4GHz! "No more will gamers need to worry about spending extra money to enjoy a more powerful gaming experience!" The last statement is, of course, a little hyperbolic, but the functionality means that users with the right motherboard and Intel's Core i7-875K or Core i5-655K can press the OC Genie Button to gain access to the unlocked CPU multiplier in the new Intel K-series chips. "With the latest version of the BIOS, endusers with a MSI P55 mainboard series can upgrade their OC Genie at no extra cost to enjoy improved computing performance and a higher adrenaline rush!" concludes MSI. So a quick flash of your BIOS will also give existing owners of MSI P55 boards access to the auto-overclocking joy that comes with the Intel K-series.